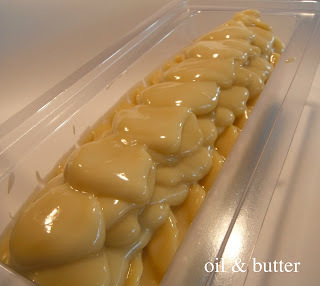 I decided to go ahead and make this soap now, even though it will be for Christmas gifts. I want this soap to have a nice, long cure time. This soap was a real challenge for me! It was my first time using a couple of the ingredients in soap (mango butter and jojoba oil); the first time I’ve made a 100% milk soap (it was easier than I thought it was going to be! 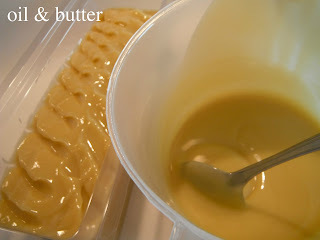 ); and the first time creating such an elaborate soap recipe using so many specialty ingredients. It’s also my first time posting a picture tutorial! 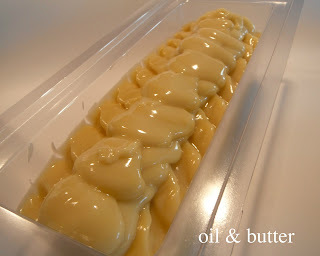 One of my blog followers requested that I do a detailed picture posting of the making of this soap, so here it is! 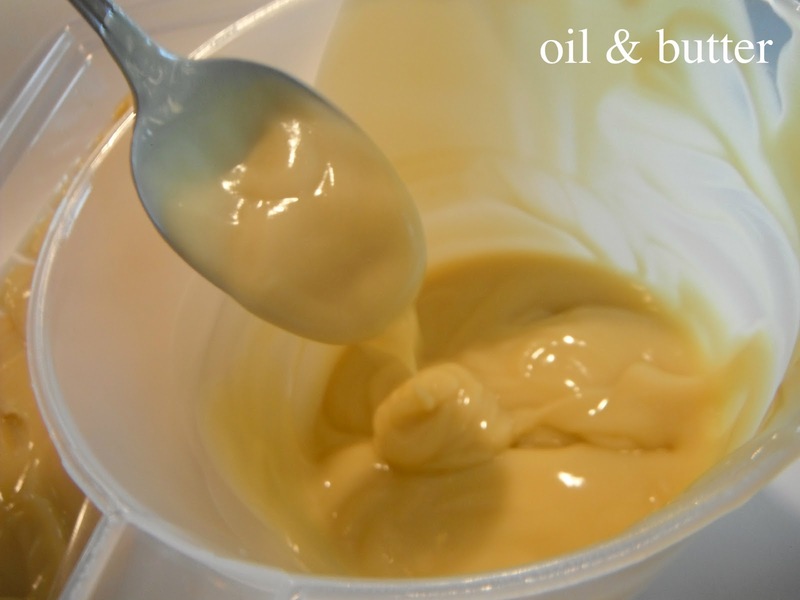 Here are the all oils and butters combined. 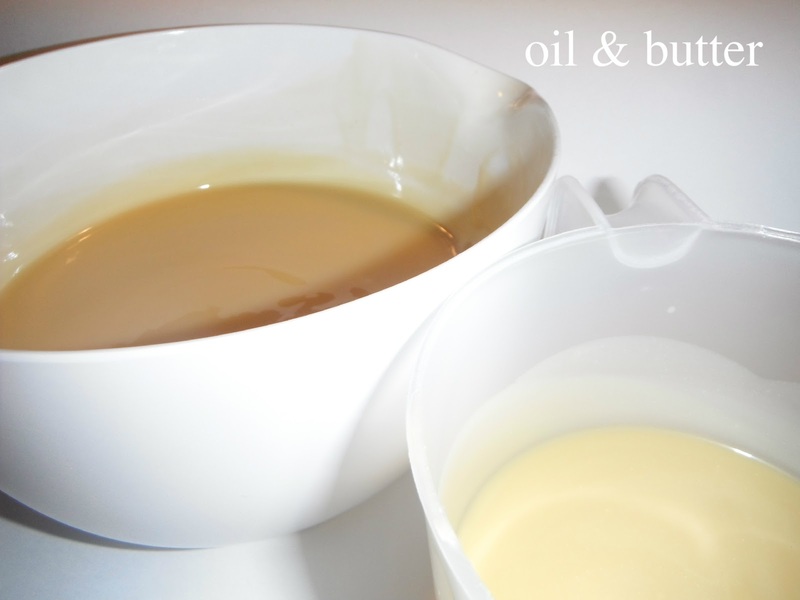 Notice the lovely dark color of the oils when they are mixed all together? I used extra-virgin olive and avocado oils as they are darker in color, and I wanted to impart some of that natural color into the soap. I soaped with room temperature oils, so the only ones that I heated were the solid ones (palm oil, coconut oil, shea butter and mango butter), which I only heated enough to melt. 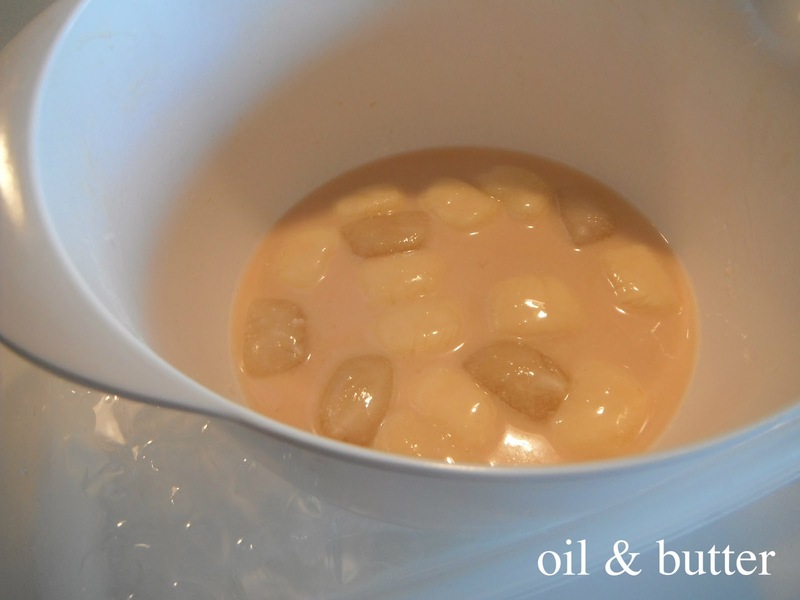 I froze the goat milk and almond milk into cubes (I've included the recipe for the almond milk below). After I measured the goat milk and almond milk into the container, I sat it in an ice bath, to keep the milk cool while I’m adding the lye. I’ve just sprinkled in a little bit of lye to start. I incorporated the lye very slowly, stirring constantly. It took me about 20 minutes total to incorporate all the lye. Here is the milk/lye solution after 5 minutes, I’ve added only about ¼ of the lye at this point. It’s starting to melt the milks, but they are not overheating at all. Slowly keep stirring and adding, stirring and adding! This is 10 minutes after I first started adding the lye, I’ve added about ½ of the lye at this point. I’m not sure what the temperature of the lye solution was at this point, but the container stayed cool to touch the entire time I was incorporating the lye. This is 20 minutes after I started and all of the lye has been incorporated. Here I’m adding sodium lactate, but this is an optional step. I add sodium lactate to my soap to make it harder, which makes it much easier to unmold my soap! I use sodium lactate in both my cold and hot process soaps. 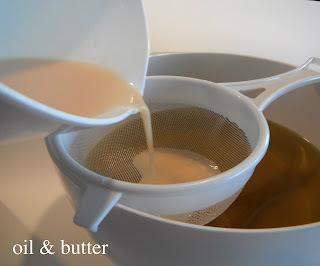 Next, I poured the milky lye solution through a strainer to remove any congealed fat or sugar from the milk. Incorporating the oils and lye solution. I always whisk my soap for the first 2 minutes or so before I start stickblending. It didn’t take me very long to reach thin trace once I started using the stickblender. Now that the soap is at a thin trace, I split the batch into 2 portions; a larger portion that I am going to incorporate the honey into, and a smaller portion that I’m going to incorporate the chamomile extract into. I decided to lighten up the smaller portion of the soap using white mica, so that I could do a little swirl and have some contrasting color for the top of the soap. Here, I’m adding some super pearly white mica that has been dissolved in a bit of sweet almond oil. Next time, I would add a bit more mica or add a bit of titanium dioxide, as there wasn’t quite enough color contrast. I added the honey to the larger portion and chamomile extract to the smaller portion. 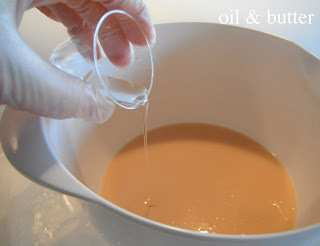 I diluted the honey in a little bit of distilled water to make it easier to incorporate into the soap. You could certainly use more honey, but would have to be careful about it overheating. I also added fragrance oil to each portion too (I usually add fragrance oil at the very end to try to avoid any acceleration issues). Here, I am doing an in-the-pot swirl. It’s really hard to pour soap with one hand and take a picture with the other! I don’t tend to swirl too much at this point, because it will naturally swirl as you pour it into the mold. Filling the mold; it’s hard to see in the picture, but there is a really light contrast in the colors, and gravity is helping the swirling process along just fine. This is the way I do my tops right now. It’s hard to explain, but I use the back of a spoon to push back some soap along each side to create ripples. Next, I will start to pile up some soap down the centre, but first I have to wait for it to thicken up, it’s too thin yet. If I tried to pile the soap onto itself at this point, it will just spread and not hold a shape. This is just a few minutes later, you can see the soap is starting to thicken up a bit. It’s able to hold a soft shape, but I would like it to be a thicker yet. I cheated and stickblended it a tiny bit more to get it to the consistency I like for this step, which is like a thick pudding. Now I can start to mound the soap up down the center. First, I spoon some soap in a single layer down the centre. I don’t try to pile it up yet, just work a layer at a time. Now, I start to build the centre onto itself. This is the second layer down the centre. Final layer of soap down the centre. I try to stagger each layer of soap, so that the mounds are offset as they pile up on each other. That’s it! I had to resist the urge to sprinkle glitter down the middle. I love glitter on soap! Next time I might add silk to this batch, and I'm going to try increasing the honey up to 1 tbsp, and also increase the avocado oil. Almond Milk Recipe: Measure 3 cups of distilled water and 1 cup of almonds into a large jar or bowl. 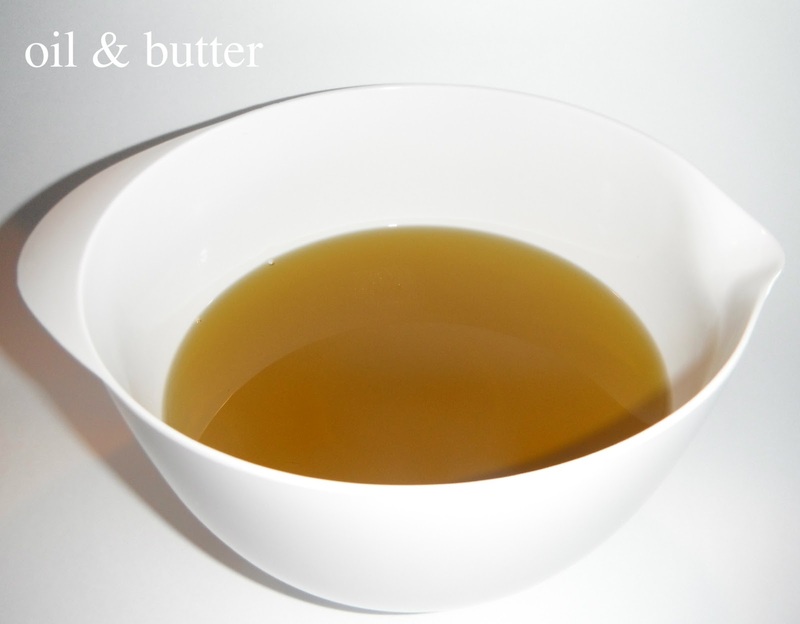 Soak for 24 hours in the refrigerator. 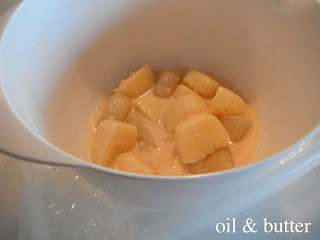 Pour water and almonds into blender and blend until smooth. Strain through cheesecloth. Wonderful soap! As so pictures, and your mould and everything! So clean and neat! Bravo! 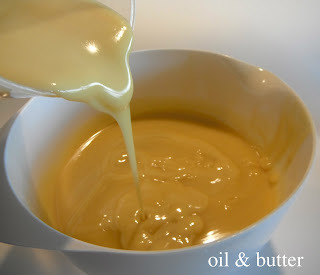 Looks so eatable, like some caramel ice cream! You didn't tell us what fragrance you used! Whatever you'd chosen to put in it, I'm sure this soap will be a real indulgence. Even without fragrance, its ingredients will be bringing happiness to the skin! Thanks for posting all those lovely pictures (along with tutorial), now waiting for the cutting part! This soap looks sooo good! And I love the recipe. 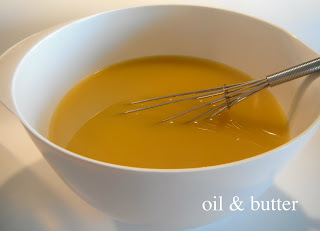 My favorite butter is definitely mango butter. 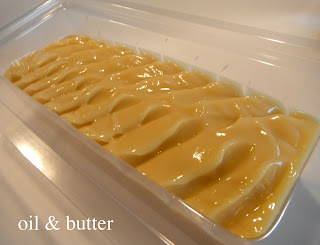 I have just planned a soap with mango butter and goat milk. Thank you Kirrpu! Your mango butter and goat milk soap sounds soooo nice, can't wait to see it! 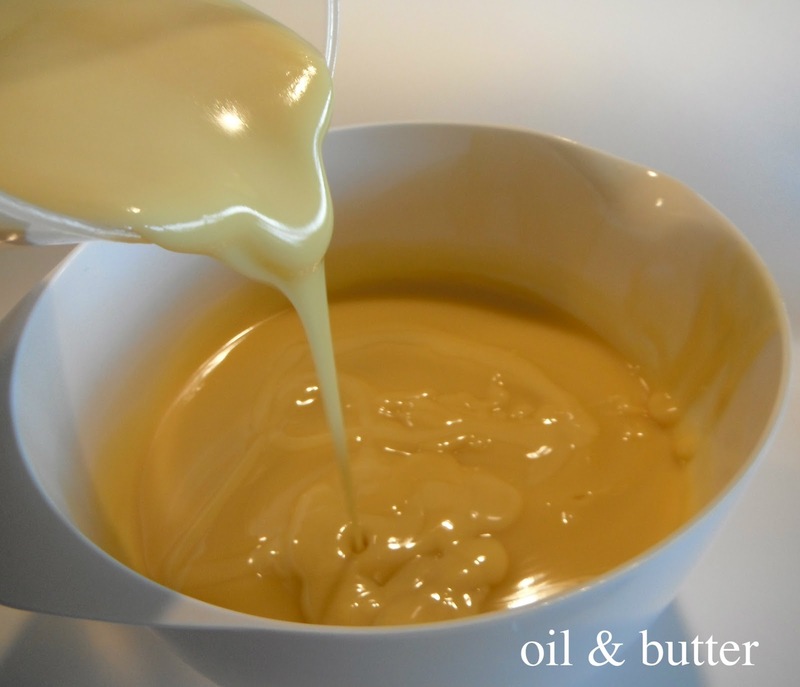 It looks so beautiful and creamy! Can't wait to see it cut, and hear how you like the new ingredients! Thanks Laura =) It's still pretty soft from not gelling, I'm trying hard to be patient! 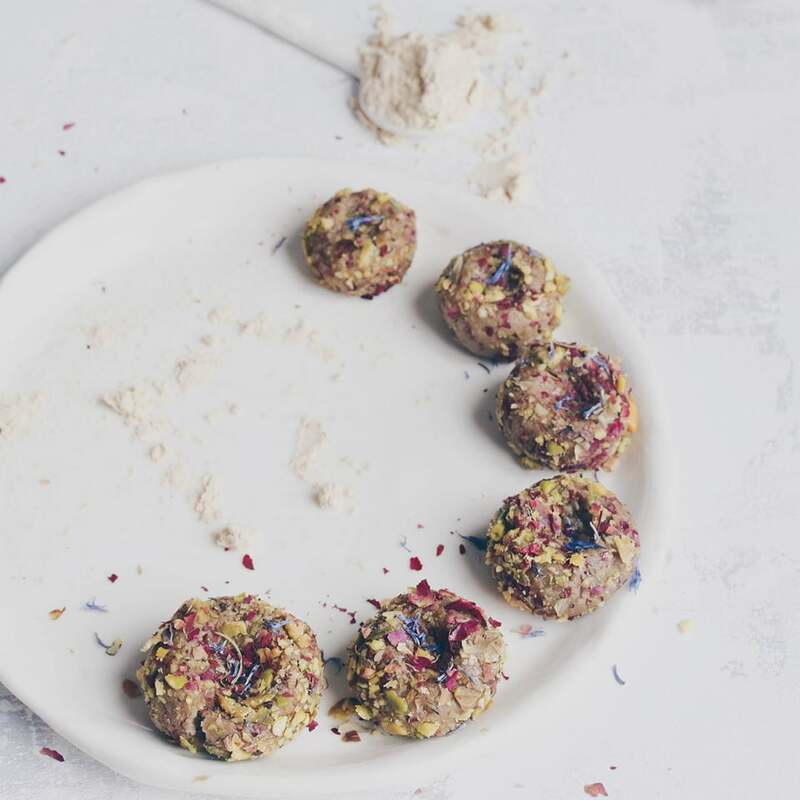 All of those wonderful ingredients should make for a lovely luxury bar indeed! Thanks for sharing your recipe and your method. And thanks especially for sharing your technique for making textured tops. I still haven't gotten the hang of that yet, and I want to get better at it. I can't wait to see your soap cut! 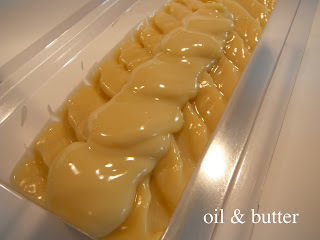 Beautiful soap, and a wonderful tutorial! 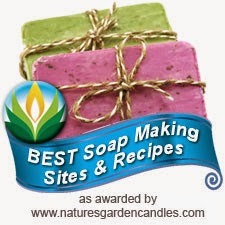 I have always been interested in soaps and the making but not into the fiddly kinds. 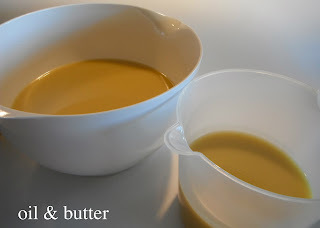 What I am wondering is since I have bits and pieces of soap left over (as you do with a family) I am wondering if I could melt them down and re-mould them and if so what liquid would I need to use for this? Hi Liz, thank you so much for stopping by my blog! Unfortunately I don't know how well, or even if, regular bars of store-bought soap would melt. 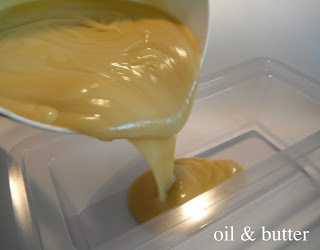 I would suggest posting your question in the comments section of this SoapQueen rebatching tutorial: http://www.soapqueen.com/bath-and-body-tutorials/rebatch-soap-plastic-baggie-technique-2/ Their staff is super helpful and very good about answering questions, hopefully they will be able to help you. Alternatively, you can buy special soap that is made specifically for melting and molding, called melt-and-pour soap. It's extremely easy and quick to use, you can be as simple or elaborate as you want with it, it's how I started out soapmaking. Hope that helps! Gorgeous soap! I'm getting back in after ten years off, and finding I've forgotten nearly everything. How much white mica did you use for the smaller portion? Thanks Sagehill, welcome back to the soaping world! You'll find it will all come back to you once you start again :) This was a small batch, so I probably only added about 1 tsp of white mica to that smaller portion....I would add more next time though, or add a bit of titanium dioxide to define the lighter color better, the swirls got lost in the darker soap. I hope that helps! Wonderful tutorial, thanks for sharing. Your soap really looks great. Do you have any pictures of the soap cut that you could share. I'd love to see the final cut bar. Hi Shane, thank you for asking, yes you may share it. I created the ripples with the back of a spoon, the trick is to make sure the soap is thicker, so that it will hold the peaks. 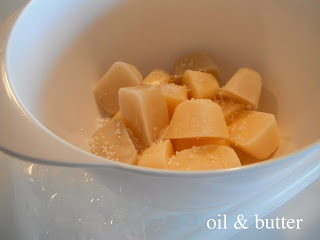 Thank you so much for that well explained tutorial, love the simplest and elegant look, I always said "less is more"and that applies perfectly in this case, very elegant soap. 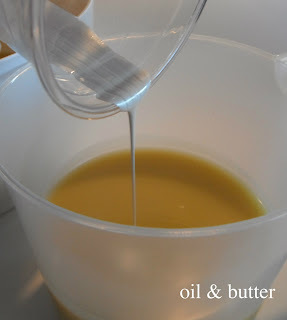 I'm new in adding fragrance to the soap, can you please tell me how much you added to the recipe? I know it is a personal preference, but with such a beautiful recipe, I would like to follow your recommendations. Thank you for sharing your knowledge and recipes, it is very kind of you, you are a very good inspiration. Thanks for stopping by and for your nice comments! On average, I like to add 0.8 ounces of fragrance oil per pound of oils. This recipe is just over 2 pounds of oils, so I would have added 1.6 ounces of fragrance oil. I hope that helps! HI, I made this yesterday and followed the recipe, except for the sodium lactate & colors, I was afraid it would trace too fast. I went to cut it tonight (30 hours after pouring) and it is soft like butter. Is the sodium lactate the key? I'm a little worried. I used rosemary, lavender, lemongrass, & lemon EO and it smells incredible! Hi Sher, yes, leaving out the sodium lactate would make the soap softer. I find my milk soaps, like this one, are always softer too, so it could be the combination of it being a milk soap and omitting the sodium lactate. I would give it another day or two and then try again. Your EO blend sounds amazing!!! This was the first soap I ever made and it has been my best seller so far. I am forever grateful to you for sharing something this fabulous!! Hi Thank you for sharing this lovely recipe. How long does this milk soap take to mature/before it can be used? What could I sub for Palm oil? 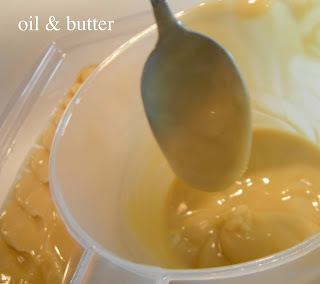 I have cocoa butter and Kokum butter, I would love to try out Kokum butter as I have a good bit of it and have never soaped with it. Love this recipe!! What can I use in place of the palm oil? Yes I would like to know as well. Can I use the box almond milk? And a possible sub for macadamia oil? Sorry I don't have that on hand. Or can I use all goats milk without almond milk? Thanks I am new to this! I wanted to print off your recipe to try making this soap tomorrow. a huge graphic appears superimposed on top of your instructions and when I scroll down to go past the graphic, I've missed almost all of your instructions and images, and half of your recipe. The URL of the graphic is https://mijnzeep.wordpress.com --- which I can't seem to delete. I tried opening another webpage to see your instructions, but the graphic won't go away. Is there any other way I can get your recipe for this soap. I'd like to try making it tomorrow when my girlfriend comes over to craft. Cee, Are you reading your comments? What's with the graphic on top of the instructions? 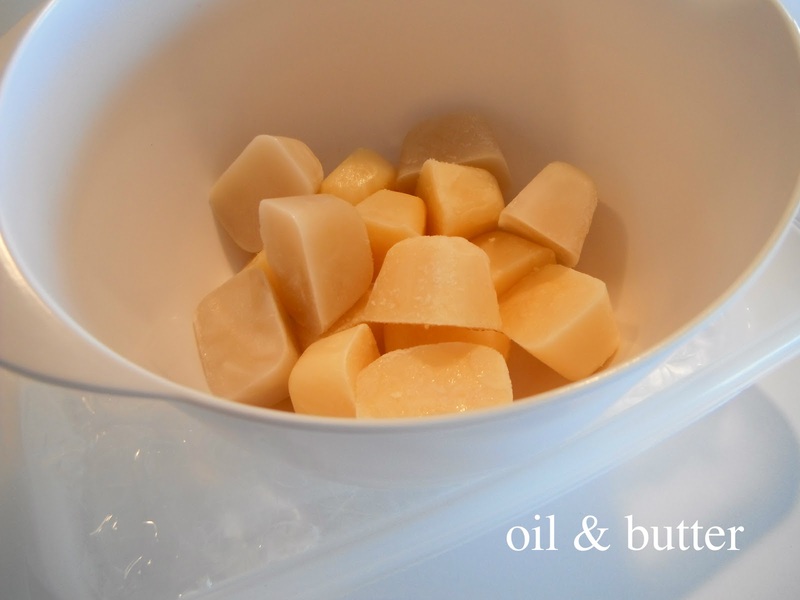 That graphic is annoying on all of your awesome posts, but it's covering the instructions of a really great soap recipe. We love your blog, darling. Please fix this! Same problem with the graphics here too. Did you know you can shorten your long links with AdFly and make cash for every click on your shortened urls. Did you think about using the most recommended Bitcoin exchange service: YoBit. It’s really great information for becoming a better Blogger. Keep sharing, Thanks. 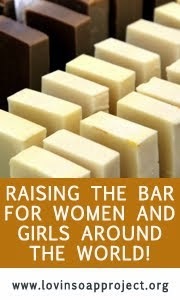 For more details to visit Almond And Cocoa Butter Soap. I've recently found these very cheap high-quality Essential Oils and thought you might like them too! They also got butters and a lot of cool stuff, so you might want to check it out too!